Nigerian born, but Ghana based Ruth Gbenga Kadiri, who goes by the stage name-RGK, is currently in town to promote her debut effort as a budding Pop and Hip -hop artiste. 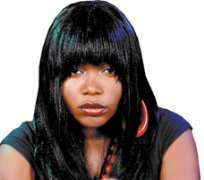 Her nine-tracker album entitled Life Is A Trick, was produced in Ghana and currently enjoying massive airplays and reviews on the airwaves. In a chat with us, the widely traveled singer, who went into professional music two years ago, further revealed that plans are already on ground for the official launch of the work in major cities of Ghana. The Edo State born act, said the Nigerian launch would immediately follow suit, adding that she is already discussing with promoters and artiste managers, on the possibility of a nationwide launch/tour. The act who is also a professional dancer hinted that she and her crew are already on locations in both Nigeria and Ghana lensing the remaining musical videos of the album. “ We are looking at the possibility of releasing the full album and the videos simultaneously in both Ghana and Nigeria. The only snag is that we are still looking for reliable marketers, distributors and promoters. Because everything is ready”, she enthused. RGK, who was hugely influenced by the songbirds duo of Whitney Houston and Maria Carey, said she relocated to Ghana, based on the advice of her foreign management team, and till date has not regretted the move. She however, hopes to be shuttling between both Nigeria and Ghana.